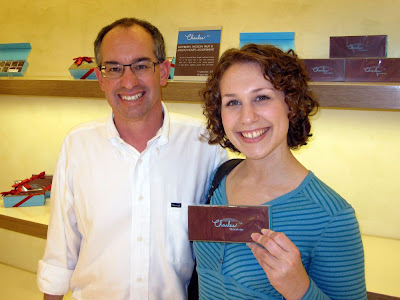 Chuck Siegel, owner of Charles Chocolates, and me! Full disclosure: I love Charles Chocolates. Oh wait, that's the point of this post. Hehehe. 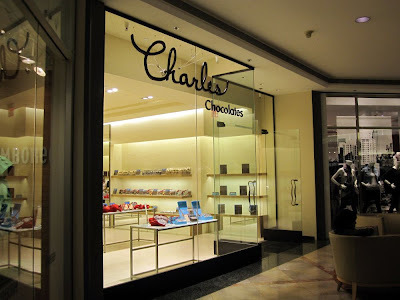 This Sunday is Mother's Day and whether you've already picked out the perfect gift for mom or you haven't, you should consider one more thing: Charles Chocolates. Truth is, you don't really need an excuse to treat yourself or a loved one to high quality chocolate. But if you buy Charles Chocolates for Mother's Day, the packaging is extra special. 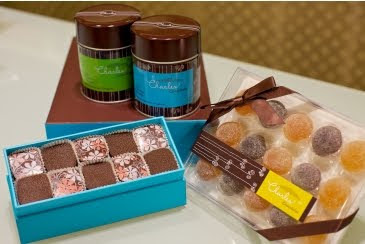 Charles Chocolates, owned and run by Chuck Siegel, is a fabulous gourmet chocolate company based in San Francisco, but available online, too. They recently opened a flagship store in the big newish Westfield Shopping Center in downtown that has the beautiful Bloomingdale's and gourmet food court. This location makes me sooo happy because now these treats are convenient for the cityfolk! Turn your fantasy into a reality? Done! All of the chocolates are made in small batches, maintaining the integrity of the chocolates. And you should see how perfect each one looks as you hold it up to your magnifying glass. Because of course you have a magnifying glass you dedicate just to chocolate inspection. Charles Chocolates is perfection. There are three gift options that are specifically Mother's Day themed. You could order the Mother's Day Edible Chocolate Box, where everything but the paper wrappers is meant to be eaten. And my Uncle Gary would probably even eat the wrapper if it had a fleck of chocolate on it. For $60, you get 18 pieces of chocolate and the gorgeous edible box they're in. 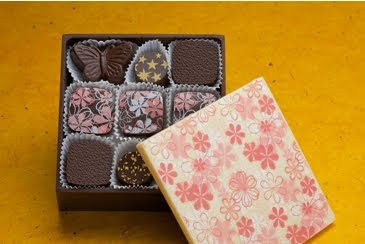 The pieces include fleur de sel caramels and Chuck's famous peanut butterflies, plus more. Another option is the $20 Mother's Day Fleur de Sel Caramel Collection in a beautiful non-edible blue and brown box. If I were a mom, I'd be thrilled to receive this gift! Future kiddo of mine, I hope you're listening! And the third option is Three Months of Treats for Mom where you'll hook your mom up with Charles Chocolates from now until July 9th. I might have missed my chance on this one since orders needed to be received by May 5 so Mom could get her first of the three treats right away. That option is priced at $68. There are lots of great chocolate items available year round that would also make fantastic Mother's Day gifts. 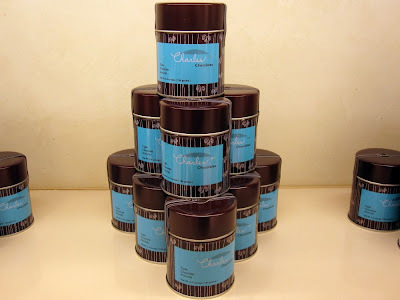 One of my favorite Charles Chocolates products is the can of triple chocolate covered almonds for $12. Bite one in half, then examine the cross section, and you'll see just how thick the chocolate coating is around this almond. You will go nuts! Good luck making up your mind what to order. It's never easy. But it's a good problem to have. Happy Mother's Day and give your mom a big kiss for me this weekend! I am not sure if you gave away your surprise Mother's Day gift, but I don't mind if it's not a surprise. Also, just so you know, I will be happy with any chocolate from Charles Chocolates! I have tried a lot and love them all!! !